Jermaine Christopher Chism, also known as "Big Mayne" was born January 3, 1989 and raised in El Centro, CA. He was influenced through out his childhood to begin a music career, however, he was always too shy. The courage within him came out after his cousin; his role model and inspiration, deceased in 1998. (Sean C. Fuller) He began putting together his rhymes and working with his home made studio. Big Mayne started influencing others as his cousin did him. He became very familiar with all the technicalities of the music industry, and started developing a plan of attack. He has achieved many mixtapes, ranging from love songs to freestyles about the experiences he has had through his life. When "Big Mayne" was asked what he could possibly bring to the music industry, his response was simple. He stated " My music is real. My music brings my all to the table. It is something almost everyone can relate to. The best thing about it, It gives me a chance to release all of my emotions. "Big Mayne" has goals to turn the music industry into his carreer, and do something with his amazing talent. His plans are to have a big finish, give back to his community and take care of the people that mean the most to him; his family. 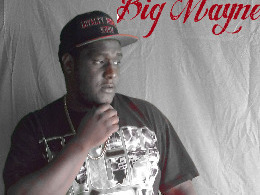 Big Mayne is an artist at Loyalty Krew Respect LLC (Records).